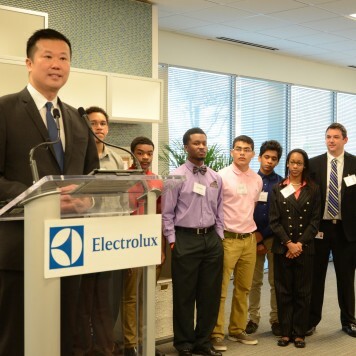 Newsroom / Charlotte / Electrolux Celebrates New Research and Development Center in Charlotte, N.C.
Electrolux Celebrates New Research and Development Center in Charlotte, N.C.
CHARLOTTE, NC, March 27, 2014 – Electrolux today celebrated the opening of its new fabric care research and development center in Charlotte, North Carolina by showcasing its latest product innovations. 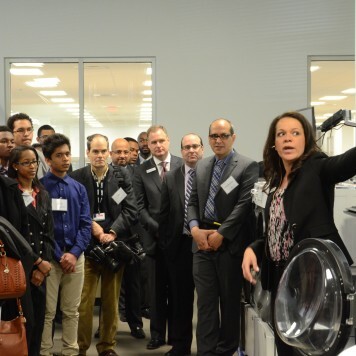 Invited guests, including a group of students from the engineering academy at Vance High School, toured portions of the facility to see first-hand how the company uses high-tech engineering to translate consumer needs into innovative product benefits. 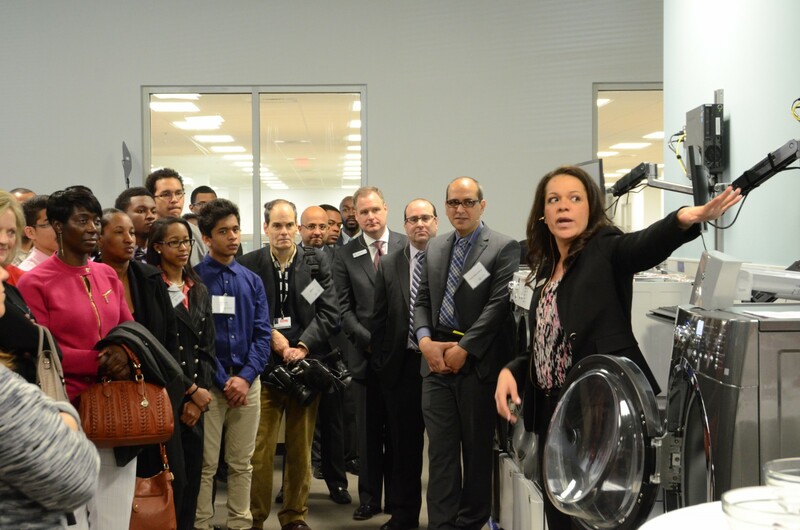 Fast Cycle Speed– Consumers want a fast wash cycle, but the average industry cycle time is 57 minutes. Electrolux’s motion technology moves the clothes inside the tub while recirculation technology distributes soap and water fast and thoroughly, cutting down wash time to as low as 15 minutes. Fact: The tub spins at 1,400 RPMs – the equivalent to a Ford Mustang going 130 MPH. Maximum Capacity – Consumers do nearly eight loads of wash per week and want appliances with maximum capacity. Electrolux maximized the tub size by using advanced vibration and motion technology to precisely control the tub’s movement. That allows for maximum expansion of the tub within the exterior walls without the tub hitting the walls as it spins, even at high rotational speeds. 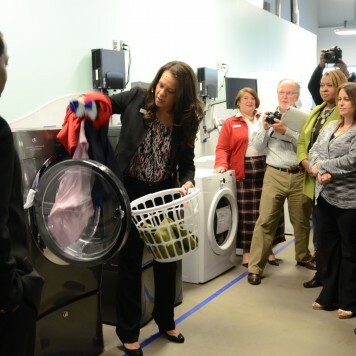 Water Recirculation– Clean, fresh clothes are of utmost importance to consumers. To ensure clothes are their cleanest and freshest, Electrolux has developed a unique rinse mechanism that bypasses the soap dispenser, reducing the residual detergent to 0.05 percent. This rinse system also allows steam to move from the bottom of the tub up through the clothes, which is more effective at removing stains given that steam rises. Fact: This unique technology is 400 times more effective and also reduces water consumption by 80 percent to 12 gallons per load from 60 gallons. Balanced Capacity– Consumers want to do large loads of wash to minimize their total number of loads. But large loads, like towels and sheets, can cause a washer to become unbalanced during the spin cycle. Electrolux has developed a unique technology – its counterbalancing mass dampener – to act as a shock absorber and automatically counterbalance the drum based on its weight and speed. 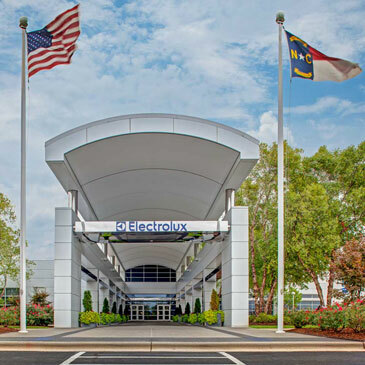 Fact: Electrolux’s new fabric care R&D center has a lab dedicated to testing products on different floor types such as hardwood, tile and laminate, and using laser probes that measure product displacement. 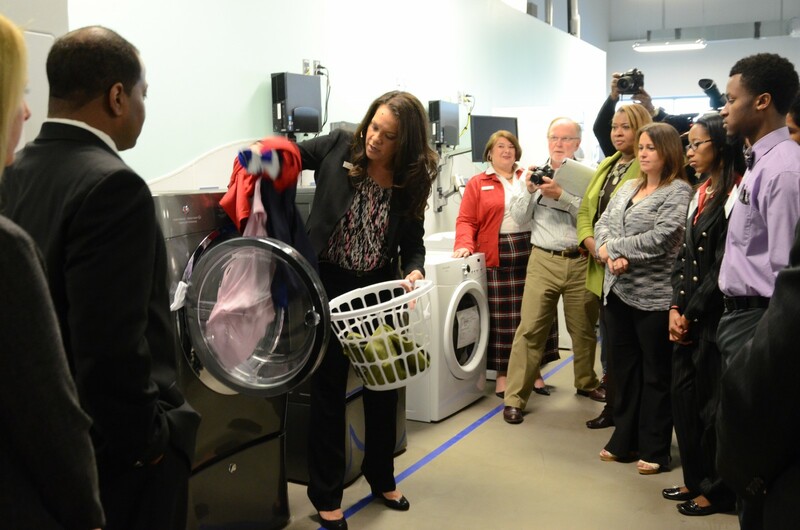 Laundry Center– Consumers have limited space for washers and dryers. Electrolux’s laundry center has the first high-efficiency top load with no-agitator technology that creates a gentle wash, with minimal wear and tear on clothes.Fact: Electrolux invented the Laundry Center in 1970 and also was the first to invent a high-efficiency Laundry Center. The R&D center currently brings 60 research and development roles to the city, growing the company’s local employment to more than 925 and includes new positions in engineering, product design and testing. 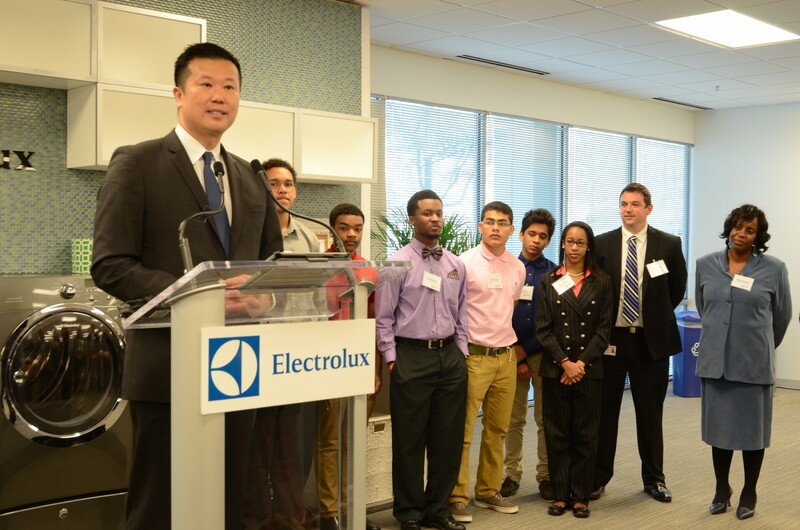 As part of this announcement, Electrolux also donated $20,000 to Vance High School’s Engineering Academy. The school, which is just outside the University Research Park, will use the gift to purchase robotic parts and equipment, Computer-Aided Design (CAD) technology, and tablets and computers. 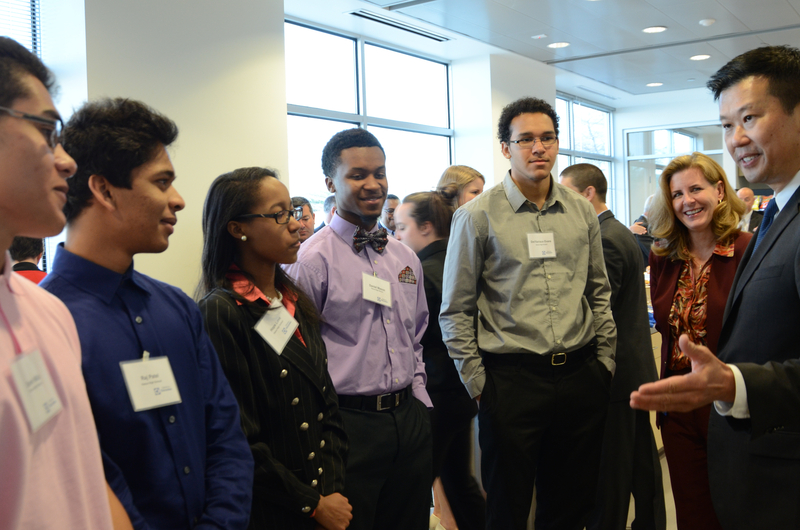 “We are pleased to be investing in the next generation of engineers in Charlotte,” said Truong.